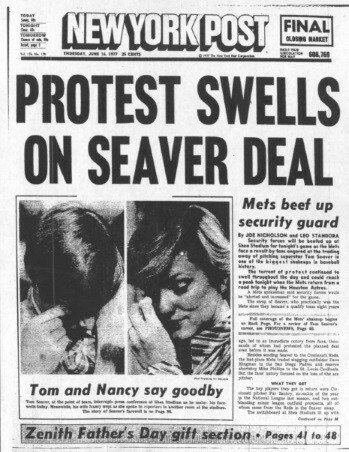 June 15, 1977, is recalled by a generation of New York baseball fans as “The Midnight Massacre.” It was this evening that the Mets traded Tom Seaver — “The Franchise,” the best player in team history, the most popular athlete in the most populous city in the country — to the Cincinnati Reds. The numbers tell us that from his 1967 rookie season to the day he was traded, Seaver was honored with the Cy Young trophy three times, and finished second in the voting on another occasion. He led all pitchers in WAR, ERA, ERA+, strikeouts, WHIP, FIP, and shutouts for the decade. Toiling for some terrible teams, he trailed only Ferguson Jenkins in pitcher wins for the decade. Only Jim Palmer — with one of the best teams in baseball behind him — bested Seaver’s winning percentage. But the numbers in this case seem insufficient to the task of capturing the athlete. Seaver’s departure was seen by many as a betrayal of the New York public trust, and here it might be said that feelings of sadness, loss, and anger do more to define an athlete’s value than every number on the back of his baseball card. Tom Seaver’s family recently announced that the great pitcher is stepping away from public life as he battles advancing dementia. Seaver, 74, will continue to work his beloved vineyard in Northern California. The Greatest Met is battling perhaps the cruelest affliction. A well-spoken, college-educated California kid, Seaver captured the affections of New York City’s gritty, hardscrabble outer-boroughs with his power and panache. It shouldn’t have been so easy: Seaver was maybe a little too handsome, maybe a little too eloquent, maybe a little too “California” to earn the trust of a jaded, twice-bitten, hometown faithful. He was a little too… soft to make it big in the Big City. But make it he did, with a pitching delivery that seemed the physical articulation of the man’s will and ambition: The famous “Drop-and-Drive” knee scraper that has served as the launch mechanism for countless power pitchers since. It was with this delivery that Seaver did what even the great Casey Stengel couldn’t do; did what many thought couldn’t be done: He conferred legitimacy on the New York Mets, becoming the face (and beating heart) of one of baseball’s most unlikely and beloved teams. Consigned to second-class citizenry in a city owned by the cross-town Yankees, the Mets mattered every time Seaver took the mound, never more so than in 1969, when Seaver (25–7) captured his first Cy Young Award and the Mets took the first of their two World Series titles. It was after the ’69 Miracle that Seaver became the brightest star on baseball’s biggest stage. Eight years later, the Miracle became the Massacre, and Seaver wept with New York. Seaver faced 19,369 batters over 20 seasons — every one through clenched teeth as he delivered that hissing fastball — and held them to a .226 avg. Only 20 men in the post-war era have pitched more than 4000 innings, and Seaver holds the lowest career ERA (2.86) on this illustrious list. He led his league in ERA, wins, adjusted ERA, FIP, and WHIP three times; strikeouts five times; strikeouts per nine innings six times. He established an NL record with ten 200-strikeout seasons, and in a nice bit of symmetry, once struck out 10 consecutive batters in a game. In addition to those three Cy Young Awards recognizing him as the league’s best pitcher, Seaver was listed on the MVP ballot in nine different seasons, finishing a close second in 1969. Four: The number of players the Mets received from the Reds in return for Seaver. Twenty-six: The number of wins (against 35 losses) for the Mets on June 15, 1977 — the day Seaver was traded. Fourteen: The number of games the Mets trailed in the standings on that day (as well as the number of wins Seaver collected for the Reds from June 18-on). Broken hearts, angry outbursts, indignant headlines, tears of outrage across New York? We can’t know. Those of a certain age can’t really understand what this trade meant to the city; those of a certain age remember all too well what this trade meant to the city. 54,032: Number of fans in attendance as Seaver won his 300th game — pitching for Chicago White Sox, against the New York Yankees, at Yankees Stadium. On the wrong side of 40 by now, Seaver used guts, guile and slop to befuddle the Yankees and enthrall the crowd (“Sea-vuh! Seav-vuh!”) on a glorious August afternoon. The time of the game was 3:20; the standing ovation afforded Seaver seemed to last almost as long. 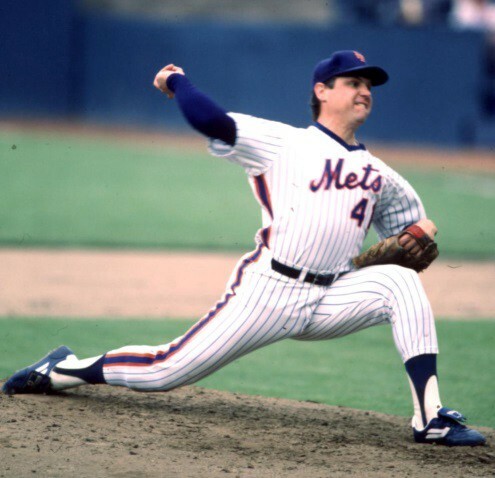 98.8: The percentage of the vote Seaver garnered in 1992, his first year of Hall of Fame eligibility. A then-record Hall of Fame vote percentage. As noted at the outset of this sketch, the numbers — as overwhelming as they are — seem insufficient to the task of explaining value, of assessing the impact of the man on a city. The Mets will, presumably, hold another day in Seaver’s honor, erect a monument outside their gates, casting that iconic delivery in bronze or steel. There will be an inscription, listing the great pitcher’s accomplishments, cataloging those numbers. Let’s hope one number is given prominence among them: 16. Because if there is one number that captures Seaver’s place in the game (and his importance to his adopted hometown), it’s this one: Over the course of his career, Seaver made 16 Opening Day starts (a major league record), 11 with the Mets. His first Opening Day assignment came in 1968; his last in his final major league season, 18 years later. It’s an honor recognizing not just a pitcher’s skill and production, but his stature on the team, his place in the hearts and minds of the fans. And no pitcher has ever been recognized in this manner as often or as long as Tom Seaver. Here’s wishing comfort and grace to Tom Terrific and the Seaver family. Jeremy Lehrman is the author of Baseball’s Most Baffling MVP Ballots.